What does BlephEx™ do for you? 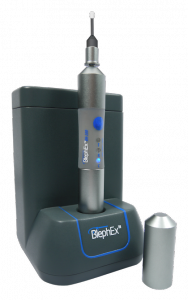 BlephEx™, the newest treatment for blepharitis, is an in-practice procedure performed directly by the eye care practitioner. Find relief from blepharitis, demodex, styes, and dry, itchy eyes caused by meibomian gland dysfunction. 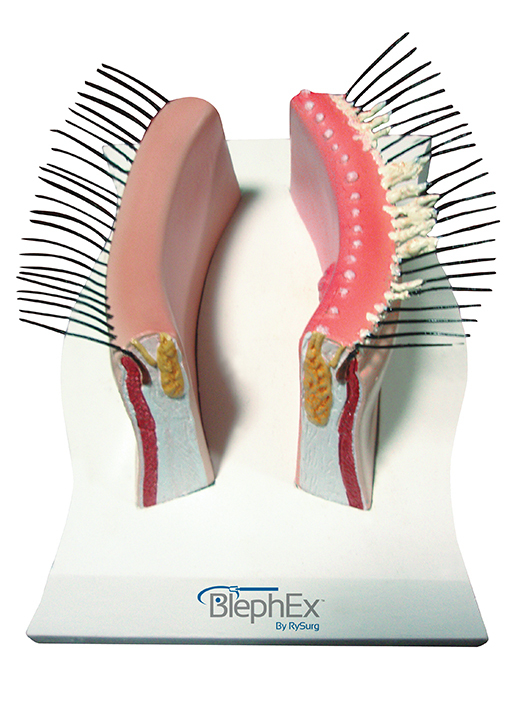 BlephEx is a new, in-office procedure that allows our doctors to completely remove the scurf, debris, crusting, and exotoxin-laden biofilm that builds up on our patients lid margins. This biofilm causes the inflammation which slowly shuts down the tear glands and causes a wide range of other symptoms.The BlephEx hand piece spins a surgical-grade micro PVA sponge at 1,000 RPM, which has been soaked in a lid scrub solution, along the lid margin. A fresh tip is used for each eyelid. Once clean, now home lid scrubs actually have a benefit in helping KEEP the lids clean, instead of expecting home scrubs to GET the lids clean. Treatments are performed every 4-6 months, sometimes sooner if necessary. Itching or scratchy eyesForeign body sensationTearingCrustingRedness/inflammationMatteringDry eyesEye rubbingProperly performed, BlephEx™ will reduce or alleviate these chronic and debilitating symptoms in your patients. Treatments are typically repeated at regular monthly intervals depending on the severity of the disease. By eliminating the inflammatory etiology of blepharitis, the overall health of the eyelid is improved. Patients can then begin to produce more of their own tears and finally enjoy a life free from the chronic and irritating symptoms associated with blepharitis and its subsequent dry eye disease. 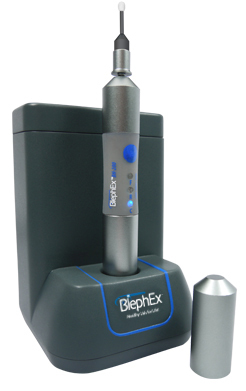 BlephEx® is a painless in-office procedure performed by your eyecare professional. A revolutionary new patented BlephEx® handpiece is used to very precisely and carefully, spin a medical grade micro-sponge along the edge of your eyelids and lashes, removing scurf and debris and exfoliating your eyelids.